@texrat – Thanks. It’s possible that other plugins would cause this sort of problem. You probably are running now, or have run in the past, the kind of plugin that would cause the behavior. Note that this is something that only happens during the 2.0 upgrade, so you don’t have to be afraid that it’ll happen again. Many apologies for the inconvenience, and thanks for your patience and help as we sort things out. @texrat – Sorry you’re still having trouble. Do you have access to your database? If so, you should check in wp_usermeta to see what your user ID’s value for wp_capabilities is (if any). I’d also ask you to double- and triple-check that you’ve followed all the instructions in the plugin – it doesn’t give any visible feedback, and if you make a wrong step (such as putting it in plugins rather than mu-plugins, or using the wrong user_login value), it won’t let you know. I was able to get in by way of another (generic) admin account I had set up. I can now see my texrat account had WP role set to “no role for this site” on the profile edit page. However, looking at the User list, it says “Spectator” for WP role and forum role (I should be Keymaster for the latter), which is the default *forum* role for bbPress. So maybe bbPress is the interfering plugin in my case? Also, all of our bbPress members who did not have any forum role assigned yet now show as Pending. Forgot to add: I did double check everything re the mu-plugins and user-role instructions. I had everything correct. Right now I cannot get any of 167 users out of Manage Signups. If I Activate someone, they remain there afterward. Plugin sanity restored, but I still have 152 pre-existing users seemingly in Pending status, although activating any or all of them results in a message that they are already activated. Which is interesting, because these users were all part of a bulk import when we changed domains last October… any idea how to clear that Pending bit? 1/ “Confirm User Registration” doesn’t seem to interfere. The plugin is adding a user_meta “authentication” set to 1 for each users. When a user logs in it checks if this user meta is there and if so allow the log in, else display a message saying the account is not authenticated. 4/ About the 152 pre-existing, the only way i’ve managed to reproduce a similar problem was to restart all again and to delete the value of activation_key meta in the database. eg : activation_key > “” : The meta is there but empty. In this case, the user keeps on being in pending after trying to activate it. I think clearing the “pending bit” can be achieve by updating the “active” field to 1 into the signups table for the 152 pre-existing users. But, before doing so, you should check the ‘activation_key’ meta values for some of the 152 users to see if the value is empty. This way it could confirm my point 4. Then you should check for the corresponding user_status to be sure it is not set to 2. Whatever you do, i advise you to backup your database before. I’ve disabled all plugins via the database but am still having the problem. How do I fix it? Do you have any plugins that deal with registration on your config ? I changed both these back to their original values but I’m still getting the “You do not have sufficient permissions to access this page” error when I try to access an admin page. @imath Yes, User Role Editor. @imath Ah the script from @boonebgorges seems to have worked, thanks! @notpoppy Great! Sorry again for the inconvenience. I’m not sure User Role Editor deals with registration as it seems to be a role management plugin. But i’ll check it. Hi! I have the same problem with admin rights. @boonebgorges ‘s fix helped me a lot. But I have another problem. This fix can’t help users which get a subscriber’s role after registration. I set an author role for all new members of my site in wordpress settings. But it had no effect. How were you doing before ? Once a user registered, you were changing the role before he activated his account ? 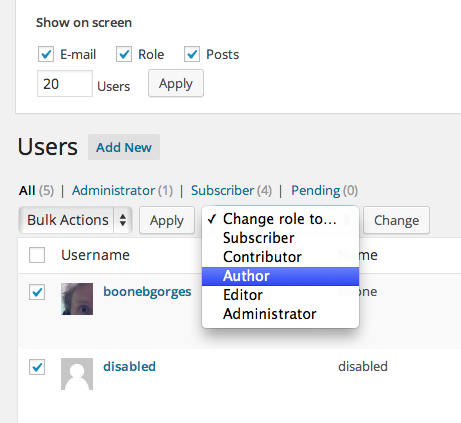 Or are you choosing a role different than Subscriber in the WordPress setting (wp-admin/options-general) > New User Default Role dropdown field ? About the upgrade difficulties, were you using a plugin that was dealing with registrations, and if yes which one ? Just tested in WP 3.9/ BuddyPress 2.0, the role set for a new user is the one that is defined in the WordPress setting (wp-admin/options-general) > New User Default Role dropdown field. Hi! I am using BP Disable Activation Reloaded plugin. I deleted it (and all other plugins, except BP). But problem with user role still exists. @livsy if you try to register a new account, this account should have the role you defined in WordPress settings. I’m very curious about what happened during upgrade. If it were possible i’d really like to view the users, usermeta and signups tables! Can you see the users with no role in your users list ? If so, you can batch create roles for these users using the “change role to” select box on top of the users list. i’m going to test BP Disable Activation Reloaded to see if the problem was linked to this plugin. How can I show this tables? I registered a new user by myself a minute ago. And I saw in his profile – he has no role for my site. Of course I can set it manualy but it is not convenient. What is your config ? The upgrade problem concerns a non multisite WordPress. Is it your config ? “Viewing the sql tables” means that you’ll need to export it using PhpMyAdmin for instance and send it to me. By the way, i’ve tested BP Disable Activation Reloaded and it’s not the cause of the problem. It’s “someone” else. I am using a non multisite WordPress. ok downloaded it. Deleted the link in your reply. You can delete it from you google drive. Thanks a lot checking it. The topic ‘Lost admin access after 2.o update’ is closed to new replies.